While I joyfully celebrate the three hours of daily work time I get when Sawyer is in school, I selfishly wish I had more time. 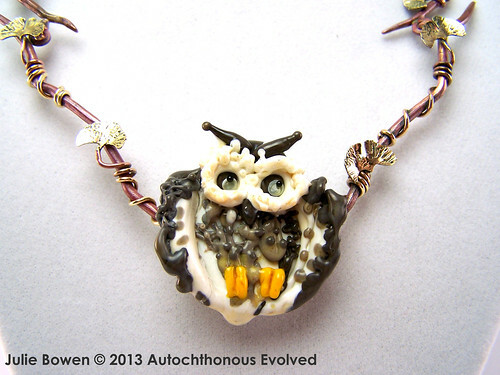 It was partially because of this that I elected to stick with my original owl lampwork pendant to use in the necklace I designed for this challenge. I don't naturally excel at sculptural lampwork and, while I have been known to plug away and create some decent sculptural work, the pragmatist in my decided to let it go this time. 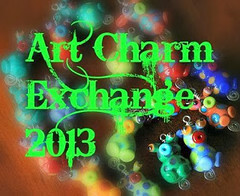 In case you missed my post announcing the challenge, here's the bead with the artwork. by Ohara Koson c. 1915. Besides the time factor, I was also more excited by the challenge of the metal components I designed for this challenge. Each link a sort of metalwork art bead of its own right. I forged, filed, and textured all of the 14 gauge copper "branches," I hand-sawed and textured each of the eight small brass "ginkgo leaves" and soldered each onto a brass wire to serve as a "stem" that I used to attach the leaves to the branches. Small copper jump rings are soldered near the ends of the "branches" in order to connect the branches and provide flexibility and movement in the design. 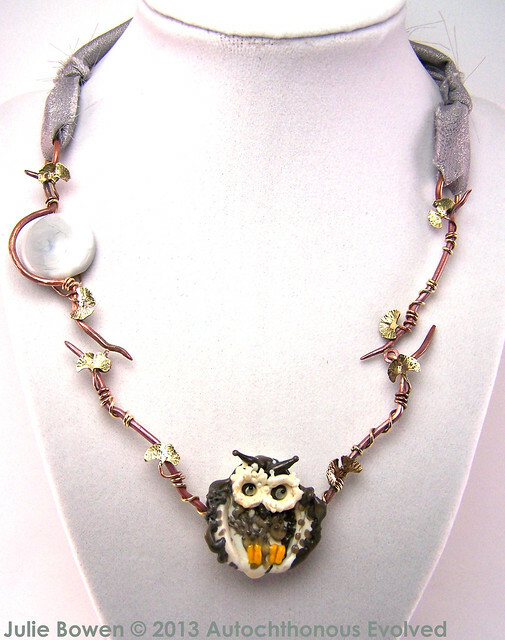 The grey silk I use in the back of the necklace as a tie-closure is meant to mimic the grey sky in the inspiration art. Additionally, the silk is meant to embody the fluid and ethereal nature of the sky. 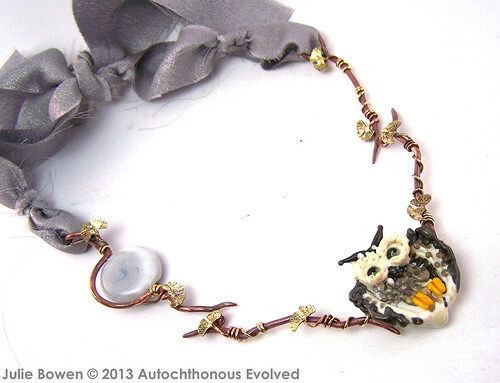 This is echoed in the main body of the necklace with the grey lentil lampwork bead (also made by me) with the crescent moon, which is also seen in the art. 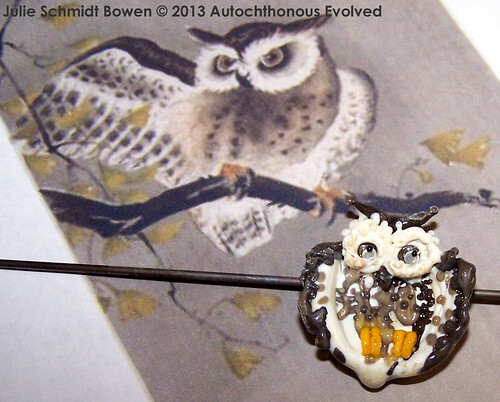 So, hopefully you weren't too put off by my lackadaisical effort at my lampwork owl. Do you think it looks like an owl? What do you think of the branches and leaves? IS the scale okay? In retrospect I wish the branches were bigger so they weren't so dwarfed by the owl. Do you like the colors? Do you like the use of silk? I can't wait to see what everyone else did for this challenge! "Hey honey, do you want to see what I'm working on?" He walked over to where I was working. "Sure! But, what's that?" he asks as he looks at my focal bead. "Here, let me show you the picture I was working from," I offered. "ooh. An owl! Why doesn't yours look like an owl?" I said, "It must be because it's a hot mess." 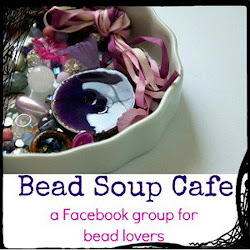 He carefully looked at the bead, then carefully reached over to touch it, and said, "No. It's cold. So, I guess it's a cold mess." Thank you so much, Niky! I just couldn't wait to get the whole thing together to see how it'd look! Aw. Thank you, Erin! I appreciate it so much! Your piece is incredible! A perfect representation of the original artwork. 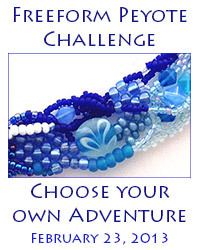 I love your focal bead and your wire work! This is a wonderful necklace!